When we talk about “keeping the lights on”, we automatically think about having enough generation available to meet demand. Electricity networks of any size are complex systems, with all the advantages and disadvantages that this implies. The uninitiated believe that the principal threat to such systems is the failure of electricity producers, the generators, to meet the demands of consumers for energy, resulting in a blackout. This is not completely mistaken, but, in fact, blackouts on a modern and developed electricity system are only rarely directly caused by shortfalls of generation resulting from poor system planning, a power station accident, or an unexpectedly high consumer demand. System operators are nearly always able, even at short notice, to call on sufficient additional resources either to increase generation or reduce demand, though of course this remedial action comes at a considerable cost. Apart from ensuring a high specification for the components used and a high standard for design and construction, the best protection against such accidents is to ensure that the system is sufficiently stable under stress that it can contain the loss of supply to a small part of the network, this capability usually being automatic since action must be taken in milliseconds to prevent a cascade of faults. Accidents will happen, but a strong system can prevent a local problem from becoming a regional or even a nationwide disaster. 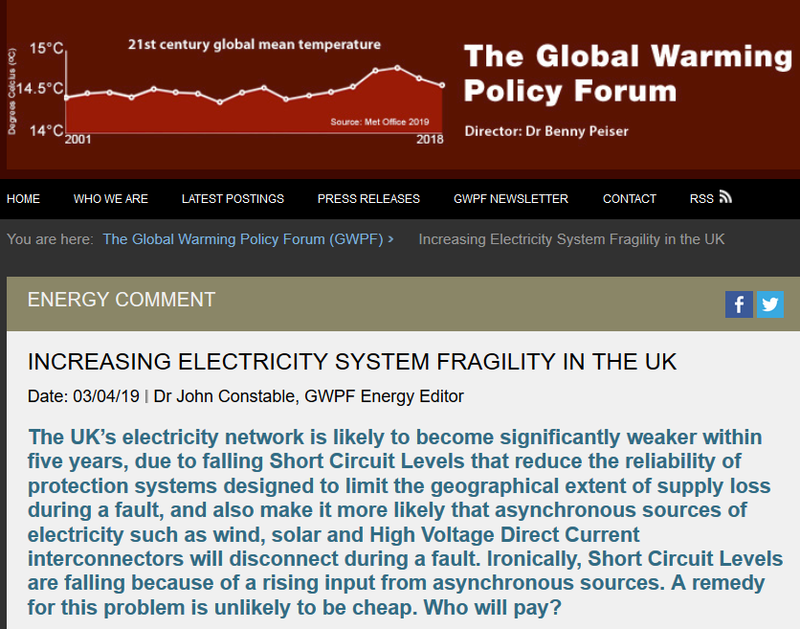 The strength of the system must be continually monitored to ensure that it will be stable under stress, a precaution that would be necessary at any time, but has particular relevance in the UK at present due to the rapid and dramatic changes in the electricity supply industry being driven by climate change policy. It is therefore only prudent for National Grid ESO (the Electricity System Operator) to have initiated detailed work on an Operability Strategy with the aim of ensuring that its System Operability Framework is adequate to the task. The first tranche of documents was published in November and December 2018, and are available at the link above, with updates being provided in the regular Operational Forums, the most recent of which was held on the 26thof March (the presentations are all available here. National Grid identifies five areas of concern, Frequency Control, Voltage Control, Restoration (i.e. recovery after a blackout), Stability, as discussed above, and Thermal (transmission line temperature). All are important, but to judge from the volume of commentary devoted to it, it is Stability that is giving most cause for concern. Specifically, Short Circuit Levels (SCL) in Great Britain are predicted to fall considerably over the next decade. The Short Circuit Level is the current that will flow through the system during a fault, an accident affecting a transmission line for example. It is, as National Grid explains, “a measure of strength”, and a “key parameter for protection systems” in the network itself and also in other equipment attached to it (National Grid, System Operability Framework: Impact of Declining Short Circuit Levels(December 2018), p. 1). With low SCL the transmission system protection systems, which function to “isolate faulty equipment […] limiting the fault effect on the wider system” (National Grid, System Operability Framework: Whole System Short Circuit Levels(December 2018), p. 2), could, in National Grid’s own words “take longer to operate or not operate as designed”( National Grid, System Operability Framework: Impact of Declining Short Circuit Levels(December 2018), p. 1), meaning a loss of supply to a much larger area. Furthermore, some generators, specifically wind and solar farms, and the protection systems of some sources of electricity such as High Voltage Direct Current (HVDC) interconnectors, may be much more likely to disconnect in the event of a fault if Short Circuit Levels are low. As it happens, the Short Circuit Level is falling in the GB network because of declining input from synchronous, conventional generation, such as coal-fired power stations and Combined Cycle Gas Turbines, and a rising input from wind, solar, and HVDC links, which are asynchronous and do not provide support to the Short Circuit Level in their vicinity. Consequently, areas where there is at present a great deal of wind and solar already have low SCL, and this is expected to spread to other areas as synchronous input declines and more asynchronous renewables and interconnectors are built. The following figure from National Grid’s publication on the subject shows regional Short Circuit Levels in Great Britain in 2020, 2025, and 2030. Figure 1: Regional Short Circuit Levels in Great Britain, 2020, 2025, and 2030. Source: National Grid ESO, System Operability Framework: Impact of Declining Short Circuit Levels(December 2018), p. 2. Taken together, these two figures show that the GB electricity network is set to become significantly weaker within five years, and much weaker within a decade. Obviously, National Grid’s aim in undertaking such assessments is to assist in addressing the problem, and it is to the System Operator’s credit that the matter is being ventilated so candidly. There is no doubt that this is a serious problem, and that National Grid takes it seriously. However, the documents so far published are longer on diagnosis than remedy. To an extent this is forgivable, since the obvious and economic solution – to run existing synchronous generation such as gas and nuclear much more while running solar and wind much less, and in the future to build more gas and nuclear and less wind and solar – is not compatible with the current politically driven selection of renewables as a means of reducing emissions. With the obvious and economic ruled out, one is left with speculative and costly alternatives, sophisticated power electronics perhaps, in combination with a requirement for wind and solar and interconnectors to improve their ability to ride through faults. While such things might be possible, none would be cheap, and such measures would certainly do nothing to alleviate concern that the United Kingdom’s electricity supply industry is greatly reducing its productivity, and making high-cost electricity inevitable, by applying layer after layer of ingenious solutions to problems that have only arisen because of flawed policy driven distortions of the market and of engineering decisions. Whether the consumer will be shielded from the burden of supporting measures to address falling Short Circuit Levels, amongst other difficulties, is doubtful. Ofgem, the regulator, is notoriously weak when climate change enters the equation. But some comfort can be taken from remarks elsewhere in the recent Operational Forum presentations. Discussing the Balancing System Use of System (BSUoS) costs, which have risen very dramatically over the last decade and now stand at £1.3 billion a year, National Grid very properly expresses the view that more of the costs of measures undertaken to address problems arising in the security and reliability of the system should be met by “those [generators] exacerbating the issue” (Balancing Service Use of System (BSUoS) Update, 26 March 2019, p. 22). This would at least provide a pricing signal to those generators at present taking a more or less free ride on the system and its consumers, and encourage them to find remedies that are better value for all. In the longer run the United Kingdom should obviously be considering whether a large fleet of asynchronous generation such as wind and solar is a wise or an affordable choice for an islanded grid that can only secure interconnection with its continental neighbours through HVDC cables that are themselves also asynchronous. The National Grid and Energy Ministers often claim that the incorporation of wind and solar within the power mix in the last few years proves that previous fears about lights going out were baseless. But currently they are still only providing 20% of the UK’s electricity, a small enough share for the rest of the grid to cope with. What will happen if, as the Committee on Climate Change want, they are supplying more than half of our power?